In this modern and technologies world, classes today are no longer, students are moving towards traditional classrooms into a computer-based online learning system. Today the online learning platform is high demand in the business market. So the entrepreneurs or coaching institutes can start their own online learning website business by using our Academy Course Learning Management Script and earn high revenue from the business. 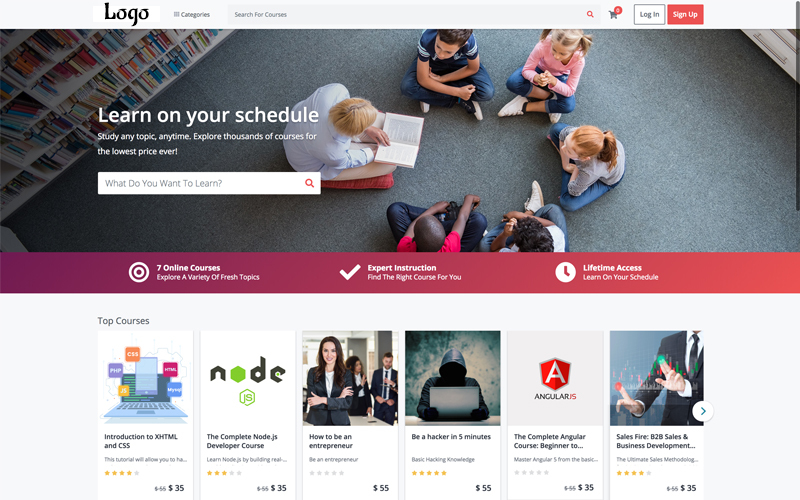 Our learning management system helps both the students and tutor to bring education into the next level and it’s the best marketplace script for online learning. In this Online Tutor Management Script, the teacher or tutor can create an unlimited number of online courses, videos, documentation to help the students to learn the same concept with the different manner. The user needs to login with the valid username and password to enter the script. In the home page, they can view the course in the system. After the detailed search, the students can enroll these courses by some charges and get skilled from anywhere and anytime. This script allows the teacher or training institute to post an unlimited number of courses. Based on the number of course purchased by the student’s teacher will get the price and the website administrator will get a certain amount for each course purchase. The main features of the Online Learning Management System are attractive user interface, powerful and user-friendly admin dashboard, secure system, course management, category management, secure payment process, enrollment management, student and teacher management, advanced course search option, user management, Mobile responsive, and many more. The script is developed in PHP and MySQL with 100% open source code and the code is developed according to the Google standard, so the script will be more safe and secure to use. The admin dashboard consists of total courses, total enrollment, total students and teachers. Admin will get the option to edit, add or delete into the system and can view all the site statistics on the dashboard and admin have full authority to control the site. Without any technical knowledge, the admin can easily handle and manage the script easily. For this Course Management Script, we provide 1-year technical support, 6 month free updates of the source code and brand free website. After purchasing the script, the site will be live within 24 hours. We are leading web Development Company offering different PHP scripts to the client at best features and cheap price.